The spectacle consists in a serie of action scenes where two actresses play and invent situations with different elements and objects. As playmates they have a bunny and a crocodile. Will be the bunny so tender as he seems? Will be the crocodile as fierce as they paint him? Poetic, playful and absurd scenes, destinated to the small children, for whom every discovery is a chance to invent a new game. This spectacle comes from the collaboration of the actress and fine artist Eva Soriano with the choreographer Joseph Stella. After developing together some dance-theater projects, they proposed to make a spectacle mixing the language of puppets and objects with other languages such as body expression and the dance-theater; an spectacle without words and destinated to the smaller children. 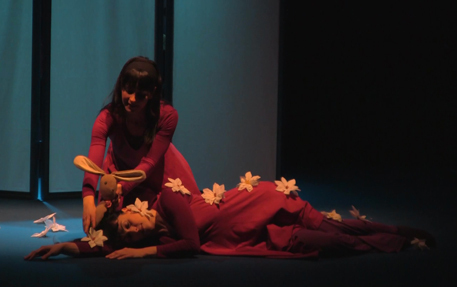 Thus, "La Canica" goes into this adventure that is "Bubu", a theatrical game for young children, a meeting between the Body Language and Theatre, between Poetry and Music, between Tenderness and Extravaganza, between Body and Objects. A little elephant full of an insatiable curiosity makes a trip through the jungle to find out what does the crocodile eat. In his jurney he will meet animals of diverse forms, colors and coats, to which he will make innumerable questions. At the end of his route he will understand that, beyond their differences, there is something in common between the animals: the earth where they live, the air that all breathe, the sun that illuminates them, the sky that the covers them. Two actresses relate and put in stage the story of the little elephant using diverse objects, songs and other theatralical resources. 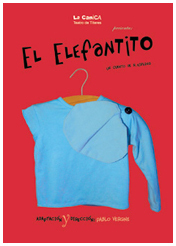 Company founded in 2005 and composed by professionals from various branches of art (visual arts, theater, dance, music...), "La Canica" has proposed the creation of multidisciplinary spectacles placing particular emphasis on the interpretation and the exploration of materials and other scenic resources to build characters and stories close to the child's world. The company's last production, "Little Mermaid" already has the critical and audience acclaim and has won the award "Best Puppet Show" ex aequo in the European Children's Performing Arts Market (FETEN) 2016. - "Best Spectacle". European Fair of Performing Arts for Children (FETEN) 2013. - "Best Actress". European Fair of Performing Arts for Children (FETEN) 2013. - "Best Spectacle". Murcia International Puppet Festival 20013. - Prize. Vall d'Albaida International Puppet Festival 2013. - "Best Puppet Show". European Fair of Theatre for Children (FETEN) 2006. - "Prize Ara Lleida Ara Titelles". Lleida International Puppet Festival 2007. - "Special Mention of the Association of Spectators". Lleida International Puppet Festival 2007. - Prize "Imagina 2007." Nerja Cultural Centre. The spectacles of "La Canica" have an enthusiastic and warm welcome by the audience and cultural programmers and are present in the most prestigious festivals of performing arts for children in Spain. - Best Show. European Fair of Theatre for Boys and Girls. FETEN 2000. - Best Direction. European Fair of Theatre for Boys and Girls. FETEN 2000. - Best Show. Teatralia 2000. - Best Aesthetics Proposal. International Festival of Vall d'Albaida. 2000. - Best Show. Bonecos International Festival of Belo Horizonte, Brazil. 2002. - Best Show. International Puppet Festival of Tolosa. 2002. - Best Show. Children's Jury. Zagreb International Puppet Festival. Croatia. 2003. - Special Jury Mention. FETEN 2003. - Best Animated Show. International Theatre Festival. Ribadavia. 2004. - Best Animation. Zagreb International Puppet Festival. Croatia. 2003. - Best Puppet Show. European Fair of Theatre for Children (FETEN) 2006. - Prize "Ara Titelles Ara Lleida". International Puppet Fair of Lleida 2007. - Special Mention of the Association of Spectators. International Puppet Fair of Lleida 2007. - Prize "Imagina 2007." Villa de Nerja Cultural Centre. - Special Jury Mention. FETEN 2007. - Prize "Drac d'Or" in Dramaturgy. International Puppet Fair of Lleida 2011. - Special Jury Mention. FETEN 2012. - Best Spectacle. European Fair of Performing Arts for Children (FETEN) 2013. - Prize "Drac d'Or" in Dramaturgy. Lleida International Puppet Fair 2013. - Best Spectacle. Murcia International Puppet Festival 20013. - Best Puppet Show. Ex aequo. European Children's Performing Arts Market (FETEN) 2016.
International Puppet Festival of Curitiba. July 2000.
International Puppet Festival of Canela. June 2010.
International Puppet Festival. Charleville-Mezieres. September 2000. Théâtre du Corps. Jeune Public. Le Havre. April 2002. Maxim Gorky Theatre. Rouen. April 2003. Fécamp Nationale Scene. Fecamp. October 2003.
International Theatre Festival Medieval and Renaissance. Anagni. August 2000.
International Festival of Animated Figures. Perugia. August 2000. Vetrina to Europe. Briciole Theatre. Parma. November 2000. Theatre of Vicenza. November 2000. First Fiera Theatre. November 2000. Teatro de Varese. December 2001. Festival dei Bambini. Piccolo Teatro di Milano. Milan. December 2001. Cultural Center Bethlehem. Lisbon. June 2001. Transform Center. Torres Vedras. June 2001. Viriato Theatre. Visseu. December 2001. 36 PIF. International Puppet Festival. Zagreb. September 2003. Bluebird International Theatre Festival for Children. Seoul. September 2003.
International Theatre Festival for Children and Adolescents. Atina Festival 2003. Buenos Aires. November 2003. XII International Puppet and Animation Festival. Mar de Plata. International Festival of Cuenca. July 2007.
International Puppet Festival. Ghent. July 2004. BuitenGewoon Festival. Doetinchem. July 2005. Seattle International Children's Festival. Seattle. May 2005. Pittsburgh International Children's Festival. Pittsburgh. May 2005.
International Arts Carnival, Hong Kong. July 2005. Macau International Arts Festival. Macau. May 2009.
International Puppet Theatre Festival. Delhi. January 2005. Jaipur Heritage Festival. Jaipur. January 2005. Spreacha. 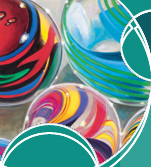 Fingal's International Arts Festival for Children. Dublin. June 2006. Young at Art. Belfast Children's Festival. Belfast. June 2008. Teatru of Animatie Festival. Bucharest. December 2006. Out of the Box. International Festival of Puppet Theatre. Singapore. May 2006. Children's Festival of Rodovre. Copenhagen. May 2012. Tallinn Treff Festival. Tallinn. May 2012. Latvian Puppet Theatre. Riga. May 2012. Joseph Stella has studied French Literature at the Faculty of Arts of Geneva in Switzerland. He continued his studies and trained at the School for Contemporary Dance Bella Hutter of Turin in Italy. Hutter Bella School was established in the city of Turin for two Russian women in 1923 and belongs to the current German Expressionist. In the last year of his training, he comes as a performer in the company of Dance Theatre School, directed by Anna Sagna, presenting several performances of the repertoire in French and Italian cities. He continued his stage experience with a Japanese choreographer, Hideyuki Yano; an English theater director, Kewin Mac Carthy; a French choreographer, Roberte Léger; another American choreographer, Katie Duck; and several other artists with different concepts of stage space and audience. Since 1990 he began to teach and offers courses in several cities in Europe and Japan, in Schools of Dance, Theatre, Circus, Cultural Centers and Casa de America in Madrid and worked for the Ministry of Education in France and Spain. - The movement of emotions. - Strength and vulnerable stage presence. - When the Space is Time, and Time is transformed into energy. As a choreographer, he performed shows and performances in continuing his research on the border between abstract dance and narrative dance.